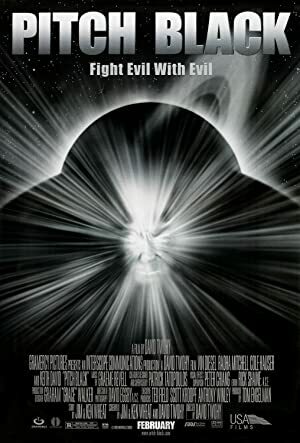 The Chronicles of Riddick – Pitch Black (2000) – What's New on Netflix Canada Today! The space transport vessel “Hunter-Gratzner” carrying 40 people on-board crashes on a desert planet when the ship is struck in a meteor storm. There are only 11 survivors, among them are pilot Carolyn Fry (Who has assumed command after the ship’s captain is killed), bounty hunter William J. Johns, religious man Abu Al-Walid, Antiques dealer Paris P. Ogilvie, runaway teenager Jack, settlers John ‘Zeke’ Ezekiel and his lover Sharon ‘Shazza’ Montgomery, and Richard B. Riddick, a dangerous escaped convict. Marooned, the survivors discover the barren and hot desert-scape has sunlight from three suns. Not only must they find food and water and worry about Riddick, the survivors find themselves being hunted by the planet’s flesh-eating alien inhabitants when the planet is engulfed in darkness, which happens every 22 years, as they emerge from underground to hunt and eat all signs of life.